Lady Lake is located at 28°55′45″N 81°55′51″W﻿ / ﻿28.92917°N 81.93083°W﻿ / 28.92917; -81.93083 (28.929165, -81.930888). According to the United States Census Bureau, the town has a total area of 6.8 square miles (18 km2), of which 6.6 square miles (17 km2) is land and 0.1 square miles (0.26 km2) (2.07%) is water. On February 2, 2007, the town was devastated by an EF3 tornado, killing eight residents. As of the census of 2000, there were 11,828 people, 6,125 households, and 4,293 families residing in the town. The population density was 1,787.2 people per square mile (689.9/km²). There were 6,998 housing units at an average density of 1,057.4 per square mile (408.1/km²). The racial makeup of the town was 95.32% White, 3.24% African American, 0.20% Native American, 0.31% Asian, 0.06% Pacific Islander, 0.37% from other races, and 0.50% from two or more races. Hispanic or Latino of any race were 1.83% of the population. There were 6,125 households out of which 7.1% had children under the age of 18 living with them, 64.0% were married couples living together, 4.8% had a female householder with no husband present, and 29.9% were non-families. 26.5% of all households were made up of individuals and 20.9% had someone living alone who was 65 years of age or older. The average household size was 1.91 and the average family size was 2.22. In the town, the population was spread out with 7.7% under the age of 18, 2.1% from 18 to 24, 8.8% from 25 to 44, 20.6% from 45 to 64, and 60.8% who were 65 years of age or older. The median age was 68 years. For every 100 females, there were 86.5 males. For every 100 females age 18 and over, there were 85.7 males. The median income for a household in the town was $32,581, and the median income for a family was $37,887. Males had a median income of $22,043 versus $18,450 for females. The per capita income for the town was $21,337. About 5.2% of families and 8.4% of the population were below the poverty line, including 39.1% of those under age 18 and 2.8% of those age 65 or over. The town operates the Lady Lake Community Building, which may be used for public events. Lake County Board of Education operates public schools in Lady Lake. The Villages Elementary School of Lady Lake, which serves the town, opened in 1999. Carver Middle School in Leesburg and Leesburg High School also serve Lady Lake. The Lady Lake Public Library is located at 225 Guava Street. ^ "Community Building." Town of Lady Lake. Retrieved on December 11, 2008. ^ "About LL Archived 2008-12-12 at the Wayback Machine." Town of Lady Lake. Retrieved on December 11, 2008. ^ "2008-2008 Elementary Attendance Boundary The Villages Elementary School Archived 2011-07-13 at the Wayback Machine." Lake County School Board. Retrieved on December 11, 2008. ^ "2008-2008 Middle Attendance Boundary Carver Middle School Archived 2011-07-13 at the Wayback Machine." Lake County School Board. Retrieved on December 11, 2008. ^ "Lake County 2008-2009 Attendance Boundary Leesburg High School Archived 2009-02-27 at the Wayback Machine." Lake County Board of Education. Retrieved on December 11, 2008. ^ "Welcome to the." Lady Lake Public Library'. Retrieved on December 11, 2008. 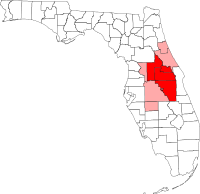 Wikimedia Commons has media related to Lady Lake, Florida. This page was last edited on 29 December 2018, at 04:21 (UTC).